Davy Vanham, born 1974 in Belgium, works since 2011 as a researcher at the Joint Research Centre (https://ec.europa.eu/jrc/en) of the European Commission in Ispra (Italy). He obtained a PhD from the University of Innsbruck (Austria) in integrated water resource management (IWRM). He has about 20 years of working experience in IWRM both in the private sector (for engineering consultants) and the public sector (universities and the European Commission), of which many years abroad. This includes several years of professional experience in developing/transition countries (South Africa, India and Ecuador). His research focuses on the interdisciplinary management of water resources and its uses, in order to find sustainable solutions to the world’s water related challenges. His scientific publications cover a wide range of topics related to water management, food, the water-energy-food (WEF) nexus, water footprints and urban water management. His interest extends to the communication of science to policy makers and the general public, also by means of photography and art. During the last several years, Hong Kong has made large investments to make its urban water supply system more water efficient and sustainable. As such, its municipal water abstraction – often defined as direct water use – has decreased. But how about indirect water use? 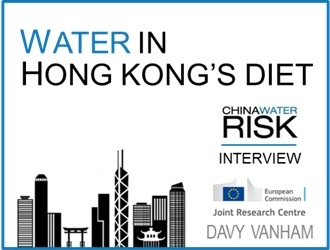 To find out, we sat down with Davy Vanham, lead author of the new research paper “Cities as hotspots of indirect water consumption: The case study of Hong Kong”. China Water Risk (CWR): Congratulations on publishing your research paper “Cities as hotspots of indirect water consumption: The case study of Hong Kong”. First off, could you tell us why it is important to consider water footprint in cities? Davy Vanham (DV): Thank you. According to the UN, by 2050 nearly 70% of the global population will live in cities, up from around 50% today. Cities are hotspots of consumption. The UN has identified sustainable cities and communities as Sustainable Development Goal (SDG) number 11. SDG 12 aims at responsible consumption. As such, the extent to which urban dwellers consume resources is key to successful global development. Urban centres are very much dependent on distant resources and ecosystems. One of these resources is water, consumed in a direct and indirect way by city inhabitants. While most people are aware of their direct water consumption (water from the tap for drinking, cooking, showering etc. ), they are not of their indirect water consumption. The latter is defined as the water that is required to produce the goods and services city inhabitants consume, i.e. their water footprint. Because the production of agricultural products requires vast amounts of blue and green water, food consumption accounts for a large proportion of the total water footprint of any urban dweller. CWR: And why have you chosen Hong Kong as the subject city? How much water does it consume indirectly from food intake? DV: Due to its political history, Hong Kong is unique in the world in data availability on urban food consumption. It is therefore the ideal case study to show typical urban food consumption behaviour and its related water footprint. Hong Kong’s food related water footprint is 4,727 litres per capita per day (l/cap/d). This is indeed much more than its direct water use (municipal water abstraction) of 3,26 l/cap/d. CWR: How does the diet of a Hong Kong citizen compare to that of a mainland Chinese citizen in terms of water footprint? DV: Interesting to see is that the current average diet in Hong Kong is very different to the average Chinese diet. It is a typical urban diet, characterised by a high intake of water intensive products like animal products and sugar, leading to a food related water footprint of 4,727 l/cap/d. In China people eat on average much more cereals and vegetables than in Hong Kong. On the other hand, Hong Kong inhabitants eat much more sugar, crop oils, fruit, meat and offals, fish and seafood and milk and milk products. As a result, the Hong Kong water footprint is almost double the Chinese water footprint of 2,413 l/cap/d. That is because it requires a lot of water to produce product groups like meat, fish, sugar or milk. CWR: In China, the government has given recommendations on a healthy diet with its Chinese food guide pagoda. How would shifting to this diet impact Hong Kong’s water footprint? DV: According to recommendations from the Chinese Nutrition Society for a healthy diet, in Hong Kong the average intake of some product groups should be increased (vegetables and fruit) and of other product groups reduced (sugar, crop oils, meat and animal fats). This would result in a reduction of the water footprint of 40% to 2,852 l/cap/d. Especially the reduced intake of meat (including offals) from currently 126 kg per capita per year (kg/cap/yr) to the recommended value 27 kg/cap/yr would results in a substantial water footprint reduction. Meat consumption in Hong Kong is extremely high. More plant based diets show even larger reductions. A pesco-vegetarian diet would result in a reduction of 49% (to 2,398 l/cap/d) and a vegetarian diet in a 53% reduction (to 2,224 l/cap/d). Hong Kong citizens can thus save a lot of water through a change in their diet. Today overconsumption and undernutrition go together in China, not at least related to increased income differences. Also in Hong Kong overconsumption and undernutrition go hand in hand, with associated health problems. A total of 47% of the Hong Kong population (54% of the males and 41% of the females) are overweight or obese according to the World Health Organisation. Another 9% is underweight. SDG 2 aims to end all forms of hunger and malnutrition. Our diet scenarios provide a healthy diet to each Hong Kong citizen. They thereby present a win–win situation, because 1) they result in a healthier lifestyle for Hong Kong citizens, eradicating overweight and under-nutrition, 2) it is expected they save in healthcare costs and 3) they also save large quantities of the precious resource water, resulting in a decreased water-related risk for Hong Kong food security. CWR: One last question: how about the water footprint of other commodities (e.g. fashion) in cities? Is it possible to quantify it in future research? DV: That is a very good question. Apart from food, city dwellers also consume other goods and services, which also require water for their production. This includes energy or indeed clothes. Their water footprint can and should indeed be quantified in future research. Water Flows In China’s Grid – Embedded water is everywhere and that includes electricity. China Water Risk’s Hubert Thieriot on recent findings that show how and where virtual water flows through the grid. Will this change how China’s grid develops?